A dog with finicky eating habits can make life tough for their owner: How do you know what food to try next? Why isn’t Rover eating well? There was a recent post on Solid Gold Northland’s Facebook page from a woman who was experiencing that very problem with her dog. Her dog is a small rescue dog, and was disinterested in eating and left food in the bowl. The woman had already tried two different brands of food. She had just heard about the good, nutritional quality of Solid Gold Products and has placed an order. 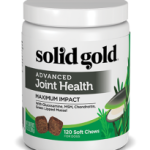 Solid Gold’s pet food enhances the total health of your pet, boosts the immune system as well as protects against disease, while leaving out the comman allergens. It is a palatable food and pets eat it well. However, for whatever reason, some dogs have learned poor eating habits. This could be because of their background, not feeding a high quality food to your dog, or even a reflection of your own eating habits. Here are some tips to help move your dog from a finicky feeder to an easy keeper. Don’t over feed. Follow the food guidelines on the package. 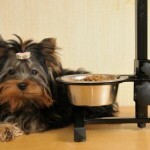 If your dog is not eating full meals, there’s a good chance you are overfeeding: cut back slightly. Respect your dog by feeding a high quality food. If you are not feeding a good quality dog food, there is a good chance your dog is not eating the food because they don’t like it and it doesn’t make them feel good. It is a good habit to feed your dog twice a day, once in the morning and once in the evening. Put the food down for only 30 minutes. If the dog is disinterested or has not finished eating in that time frame, pick up the bowl and no more food until the next meal time. Doing this consistently will teach your dog when it’s time to eat. Watch the treats; too many treats can fill your dog up fast. Get the food out of the bowl and into your pocket. Throughout the day use food as motivation and a reward for positive behavior. Make food fun. Hide your dog’s kibble throughout the house. Not only does this become a fun Hide & Seek game, it is a good way to get your dog to eat. I find most questions about finicky eaters come from owners of small dogs. Solid Gold has a food especially designed for small dogs, with bison and fish, ‘Just a Wee Bit‘. The kibble is smaller and dogs like it. 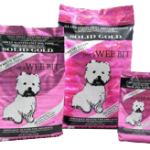 When looking for a high quality food for your pet, check out our Solid Gold products. 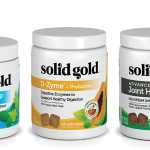 Solid Gold specializes in all natural, non allergenic pet foods, meant to boost your pet’s whole well being and immune system. Click here to find a store near you. That’s it, teach good eating habits.